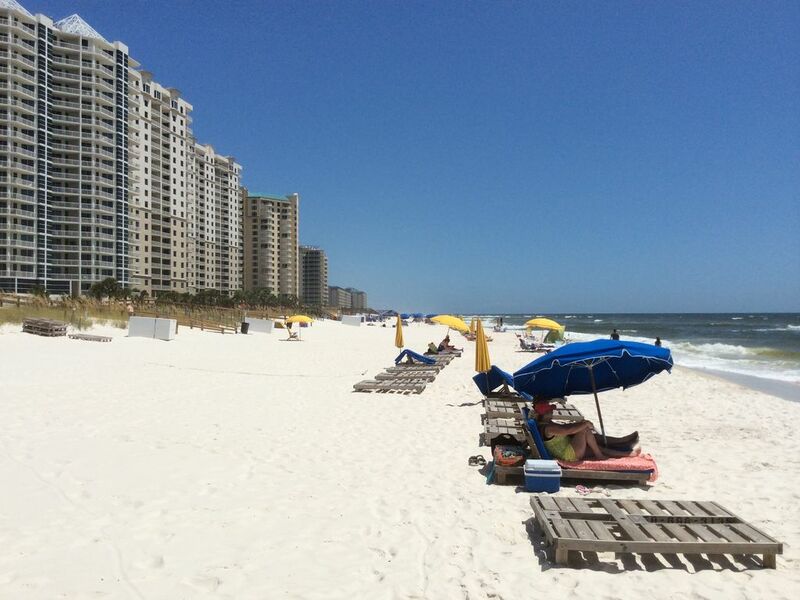 White Sands Paradise of Perdido Key beckons you with sun, sand, sparkling surf, and relaxation. Best deal on Perdido Key, right on the ocean. Enjoy a great vacation right on the beach! Look out your private balcony and you'll be overlooking the white sandy beaches and emerald green waters of the Gulf of Mexico. You will see why Perdido Key is ranked as one of the top beaches in the USA. You will find all you would ever want in a vacation for you or your family. A GREAT PLACE TO COME!!! If you're looking for activities that will excite you or just some peace and quiet, you'll find it here. A brand new shopping area with over 20 stores is just across the street with specialty shops, a few restuarants, and groceries. You'll find all the water sports and activities, shopping, fishing, fishing right on the beach front too, many golf courses, Pensacola's Naval Museum and the Blue Angels Flight Team, and Wal-Mart near by. Quite simply one of the best and affordable deals on the Gulf! Perdido Key is a wonderful place to celebrate your ANNIVERSARY or HONEYMOON. Lots of space, quiet beaches, casual and fine dining, everything you'd like for a special week or weekend away! We are right on the white sandy beaches of Perdido Key. All you see is ocean! It's a beautiful site! Spectacular view of the ocean and beaches. A gorgeous backyard!!! Private balcony overlooking the ocean and beach! Nice Golf Course 1 1/2 mile away. Perfect place for your vacation! Nice Condo with a great view. This was a really nice Condo with a view of the ocean and beach. Very easy access and within walking distance of shopping and restaurants. I highly recommend it. The only issue we had was that the housekeeping staff forgot to leave any of the supplies that typically should come with the condo, so when we arrived there was no toilet paper, paper towels, garbage bags, dishwashing liquid or laundry detergent. It was inconvenient at first because we immediately needed to go shopping as soon as we arrived. Just plan to pack anything consumable you will need and you will have a great time. We had a great time on our favorite beach in White Sands Paradise. The condo was just right for our two person vacation. Thankfully, the weather was absolutely perfect too! Thank you so much for coming to our condo for your vacation. Glad you had a great time! Hope to see you next time on your vacation here in Perdido Key. This is our second year at this condo. It is so enjoyable to have coffee on the balcony enjoying the sunshine and the sounds and view of the ocean. We were very disappointed that circumstances led to a shortened stay - we are looking forward to an extended stay next year! Owner excellent to work with, location great, view wonderful, condo very nice. This is our second year in this condo. Already scheduled for next year. Love it! The condo was exactly as presented on the website. The owner was fantastic to work with. I would highly recommend this property. Excellent place to rewind and relax! Thank you so much for coming to our condo - a piece of heaven on earth! Glad you enjoyed your stay. We stayed week of New Years Evev for our beach wedding. The condo was wonderful. Great view and access to beach. We only had a small issue while there, which Dan was very responsive and helpful on. Lots of things to do and see in the area. Definitely enjoyed our stay and will return! Thanks again for coming to our condo for your beach wedding. Have a wonderful marriage and relationship together. Come back again when you can. Cancelation Policy: Cancelation 31 days or longer, prior to rental period (week, weekend, days), renter will receive a full refund of the rental fees (if fees were paid), minus the 2.5% credit card fee charge. Also a $35 cancelation fee will be deducted from the $125 security deposit ($90 security deposit refunded). Cancelation 30 days and less, renter will forfeit the $125 security deposit. There will be a full refund of the rental fees (if fees were paid) minus the 2.5% credit card fee.